About two months ago, I returned to work full time after becoming a parent. Even though I work from home, the transition has been challenging. Getting back into a rhythm of work plus finding the right childcare, continuing to physically heal and get my strength back, navigating the world of baby development, maintaining friendships, investing in my marriage, continuing to work to find community in our new city, and growing my freelance business can leave me in a spiral of anxiety. It’s a lot and I sometimes feel like there’s more for me to manage than can fit in my brain at any given time. Sound familiar? For a few weeks I had a hard time going back to sleep after feeding my daughter in the middle of the night. It was like my mind thought it needed to stay awake to process life changes and solve problems when I really just needed to sleep. It forces me to identify a win from the day. Some days are just hard. Or tiring. Or both! Rather than letting my final thoughts before bed be about how I failed or what frustrated me, I consciously choose to find and focus on a positive moment from the day. It improves my mood. Thinking about my two to three favorite moments of the day—whether it’s my baby’s new trick, a delicious meal, or a great conversation with a client— is an automatic mood booster. It keeps me present. As a futuristic thinker, I’m prone to think 6 steps ahead but taking a moment to reflect on the day and write down the highlights reminds me how good this moment is and to to savor it. So if you’re like me and you find yourself awake at night trying to mentally spin half a dozen plates, give the highlights journal hack a try. If you’re a blog reader but don’t follow along with my journey on social media or my podcast, you may be surprised to know that I’ve been rather silent on the blog the past five months because I had a baby in October. It has been a wonderful whirlwind and slowly but surely I’m picking back up the outlets and commitments that I had prior to becoming a mom. I’m excited to share that very shortly the Hustle & Grace podcast will be back with all new episodes. I’ve already recorded several episodes including one with an enneagram expert. The conversations I’ve gotten to have thus far have been fascinating. Becoming a mother—and a working, writing, entrepreneur mom at that—has given me much more to write about than I’ve had time but I have tried to jot down my observations over on Instagram when I’ve been able to. You can catch up a bit on my motherhood journey there. Here’s my first post after Eloise was born. Here are reflections on the first month of parenthood. These are some thoughts on getting back into the groove of work. This is a short poem I wrote on growing up. And this is a few observations I made after being back at work 6 weeks. I kind of can’t believe it but we’re already up to 13 episodes on Hustle & Grace! (You can find quick recaps of 1-6 here). Have I mentioned what joy this podcast is giving me? Now, honestly, as awesome as that is, it's not really the point of the podcast. It’s about bringing you value, takeaways, and inspiration, but an awesome bonus has been how totally delightful it is to dream up each episode, talk with fascinating people, learn a TON, and then share it with the world. Thank you, thank you, thank you for listening! Episode 7: Caitlin Pyle began her work-at-home journey after getting brutally fired from her $16-per-hour corporate job in 2011. She quickly replaced her lost income by freelancing as a proofreader. Then she transitioned to helping others build their own work-at-home incomes through her blog, ProofreadAnywhere.com and later through WorkAtHomeSchool.com. Through plenty of hustle and grace, Caitlin's freelance business evolved into the multimillion-dollar media company it is today. In this episode, Caitlin shares tips she swears by in running her own business and creating the life of her dreams. We discuss the exciting project that brought us together: WorkAtHomeSchool.com. Episode 8: Lisa Rowan is a senior writer and on-air analyst at The Penny Hoarder, one of the largest personal finance websites in America. She also cohosts Pop Fashion, a top-rated weekly podcast about the business of fashion and culture. A former full-time freelance writer and vintage shop owner, she is well versed in the gig economy and the small-business landscape. Her financial advice has been featured in Women’s Health, Family Circle, Refinery29, Real Simple, The New York Times, and NBC News. In this episode Hilary brings Lisa, millennial finance expert, all her burning questions about budgeting on multiple income streams, what millennials need to know about saving, and the finance trends everyone under 40 should be paying attention to. Connect with Lisa on Twitter and Instagram @LisaTella. Episode 9: Susan Shain is a freelance writer and digital nomad who's been traveling around the world since 2008. She's written about personal finance, travel, and food for outlets like The New York Times and CNN, and does content marketing writing for businesses of all sizes. She's also the founder of WhereToPitch.com, a website for freelance writers, and author of a pay-what-you-want eBook called "The Ultimate Guide to Seasonal Jobs: How to Have Fun, Make Money, and Travel the World." In this episode, Susan shares how she has made a living living working in locations all over the world. She shares her tips for breaking into seasonal work and freelance writing and why community is a critical component of self-care for digital nomads and seasonal workers alike. Connect with Susan at SusanShain.com and on Twitter at Susan_Shain. Episode 10: Austin Graff leads talent marketing, brand, and social media for The Washington Post and is a contributor to On Parenting, news, advice, and essays for parents from The Washington Post. Prior to joining The Washington Post, Austin led digital, social, and influencer marketing for Coca-Cola’s Honest Tea brand, America’s #1 organic iced tea company. He started out his career leading social media and celebrity relationships for International Justice Mission, the largest human rights organization in the world. After growing up in Russia and Kazakhstan and attending boarding school in Germany, Austin came to the USA for university. He now proudly lives in Washington, D.C. with his wife, baby daughter, and two roommates. In this episode, Austin talks about his career at The Washington Post, Honest Tea, and International Justice Mission. He also unpacks his unique philosophy of living with roommates while parenting, his time management hacks, and how he cultivates boundaries and balance in his life. Connect with Austin on Instagram and Twitter. Episode 11: The Truth About Freelancing: In this episode, I unpack the state of freelancing in the U.S., the drawbacks of freelancing, the benefits, and 10 characteristics of people who thrive as freelancers. If you want to know more about my story and experience as a freelancer, go here. Connect with me on Twitter, Instagram, and Facebook. Episode 12: Ashley Gorley has written 37 #1 singles and has had more than 300 songs recorded by artists such as Luke Bryan, Carrie Underwood, Florida Georgia Line, Blake Shelton, Brad Paisley, Jason Aldean and Darius Rucker. He was named the ASCAP Country Songwriter of the Year in 2009, 2014, 2015, 2016, and 2017, Billboard Country Songwriter of the Year in 2013, 2016, and 2017, and the NSAI Songwriter of the Year in 2013, 2016 and 2017. Gorley has been nominated for multiple Grammy and CMA and ACM Awards, and has received the CMA’s Triple Play Award eleven times in his career, which recognizes songwriters with three or more #1 songs in one year. In 2016, he became the first songwriter to be honored with three CMA Triple Play Awards in a single year, for earning nine chart-topping songs in a 12-month period. In 2011, Gorley formed Tape Room Music, a publishing company with a focus on artist development. Writers for Tape Room Music have already celebrated twelve #1 songs and eight top ten singles by artists such as Florida Georgia Line, Sam Hunt, Keith Urban, and Dustin Lynch. At just 41, Nashville songwriter Ashley Gorley has written a mind-boggling 37 #1 hits. He has writing credits on over 300 recorded songs. Hilary got to sit down with the prolific songwriter, publisher, and producer to learn more about the hitmaker, what his day-to-day life is like, and why he prefers for Carrie Underwood to not do the singing in a writing session. Learn more about Ashley's publishing company, Tape Room Music. Listen to the Spotify playlist of Ashley's #1 songs. Episode 13: Melissa Guller, is the Head of Special Projects at Teachable - an online tool that allows anyone to create and sell their own online courses - and ever since she launched her first side hustle in 2015, Melissa has been hooked on online entrepreneurship and empowering people to go for their big, awesome dreams. A bit of a side hustle queen herself, Melissa has been a top-rated instructor at General Assembly NYC for 2+ years, and she has 1300+ students currently enrolled in her Skillshare course, “What Great Managers Do Differently.” Most recently, Melissa founded The Kindling, a community for millennial women building online businesses, blogs, and podcasts they love. Melissa Guller has made a career out of helping people monetize their expertise online. In this episode, Melissa and Hilary discuss tools to create online courses, Melissa's side hustle ventures, and why she swears by a "relaxed" list to avoid burnout. Connect with Melissa on Instagram. Episode 1: Molly Beck was a millennial blogger whose career was shaken during the Great Recession. She pivoted and went on to work with organizations like Hearst, Forbes, and Venmo. Her networking guidebook, Reach Out, was published last year. She recently launched a podcasting startup, Messy.FM that makes podcasting easy. In our conversation we unpacked her career story, networking tips, and strategies for getting a dream off the ground--whether it's a podcast, book, or business idea. Episode 2: Alexandra Silber is a Grammy-nominated Broadway actress, singer, educator and author. She has performing credits from the West End and Broadway and recently published her second book--a memoir called White Hot Grief Parade. Alexandra and I discussed diverging career paths and her strategies for avoiding burnout. Episode 3: Jeff Goins moved to Nashville to pursue a career as a musician but then changed his tune to nonprofit marketing. He eventually quit his day job and pursued his life's work: writing. He's the author of the Art of Work and Real Artists Don't Starve. Jeff's thoughts on getting paid for your art and when and how jealousy befalls creatives resonated deeply with me. I think it will with you too. Episode 4: Laura Vanderkam is an author, time management expert, speaker, podcast host, and mother of four. I've been a long time fan of her writing--most notably 168 Hours and What the Most Successful People Do Before Breakfast. She recently wrote a new book, Off the Clock, about feeling less busy while getting more done. My conversation with Laura was powerful. I was reminded that planning and thoughtful time keeping can make you feel like you have all the time in the world. I LOVE this book. More on Laura’s Time Tracking Method and sample log. Episode 5: Damon Brown is an app creator, Inc. contributor, consultant, and journalist who changed his work strategy when he became a stay at home parent--packing in more productivity to 15 hours of work per week than he had previously accomplished in 60-hour work weeks. We took a deep dive into examining Damon's recent social media sabbatical and how it impacted his business. Damon also talked about the impact becoming a parent had on his approach to work. Episode 6: In this special episode I shared my 4 big goals for the third quarter of the year. My goals this quarter are unique as it's the final 3 months of life before becoming a parent. I also shared 4 hacks for staying on track with goals and avoiding burnout and the summer slump. Hustle & Grace with Hilary Sutton is live! Let's celebrate. I'm so thrilled to share that my new podcast, Hustle & Grace with Hilary Sutton has officially made its way into the world. Whether you're an iPhone, desktop, or Android kind of listener, it's available on a platform you can use. We've started off with three episodes for you and I'll be releasing one each week moving forward on Wednesdays. So be sure and subscribe so you don't miss an episode! In the meantime, we're celebrating the launch of Hustle & Grace by doing FOUR giveaways! Subscribe, rate & review the podcast on Apple Podcasts to win a Google Home Mini! Enter the name of the podcast "Hustle & Grace with Hilary Sutton." Scroll down to "Ratings & Reviews." Enter your iTunes password if you're not already logged in. When you've completed the review, fill out this short form to complete your entry! I am so thrilled to announce that in June I will be launching a brand new podcast, Hustle & Grace with Hilary Sutton. While I can't give eeeeverything away right now, I did want to give you a sneak peak at the artwork and give you a little behind the scenes look at how the podcast is shaping up and what it's about! Next steps included finding music for the intro and outro, recording interviews, and getting the podcast episodes in the editing phase. I'll be launching three episodes right away when the podcast launches, because users can't subscribe to a podcast until there are at least three episodes already published. (Who knew?) Subscribing is critical because subscribers, reviews, and downloads are monitored. If a podcast gets good traction in the first eight weeks then it may get the coveted opportunity to be highlighted on the "New and Noteworthy" page. This can make a huge difference in terms of exposure and success for the podcast. And that's why I'm putting together a launch team for Hustle & Grace! The launch team will be providing support to the podcast launch. They'll be among the first to listen, subscribe, rate and review, and share the podcast on social media. Without an intentional launch team, a podcast (or any other kind of big launch) can fall through the cracks. Are you willing to join the launch team? It's a low time commitment and would be a huge help to me! Just fill out this form here to get on board. I'm so excited about this podcast and I can't wait to hear what you think about it. Stay tuned for the official launch in just a few weeks! This Japanese framework can help you determine your life's work. I am so excited to share a guest post by Dena Adriance today. Dena is a transformational coach and consultant, supporting both individuals and teams to discover their zone of genius and harness creative potential. I got the pleasure of being a guest on her podcast recently. I know, I know. I can hear your cries of pain at this question. In today’s world, many people are seeking more than just a paycheck from their jobs – we want fulfillment. But this is a mighty big thing to ask for, and I know a lot of people (self included) who spent our twenties (and maybe thirties, or even forties) moving from job to job to job in a never-ending, Goldilocks-style quest to find just the right fit. So I imagine, for many of you, this is a pretty daunting question. The idea that we have a singular “life purpose” – and the accompanying implication that we will be unfulfilled, or at least unhappy, until we find it – is kind of overwhelming to those of us who have a wide variety of interests and have been struggling to choose a career that we can really be happy with for a lifetime. Yet, as a coach who helps multi-passionate people to build happier, healthier, more productive work lives, I know that it doesn’t have to be this complicated, or this daunting. I recently came across a helpful diagram illustrating the Japanese concept of Ikigai (pronounced ick-ee-guy). This roughly translates as “reason for being” – in other words, your life’s purpose. As illustrated in the diagram, your Ikigai can be found at the intersection of where your talents and passions meet with what the world needs and is willing to pay for. In examining this chart, you’ll notice that when you don’t have one of the four core components of Ikigai, there is a sense that something is lacking. For example, if you are doing work that you’re good at, that the world needs, and which you can get paid for – but NOT work that you love – you may feel comfortable, but empty. Or if you’re doing work that the world needs and that you can be paid for, but you’re not particularly great at it and it’s not what you love, you may feel both empty and uncertain, and probably pretty stressed. That’s certainly how I have felt in some past jobs. So, finding your Ikigai should be the ultimate goal, right? This model can be enormously helpful as a framework to structure your career search: you start by identifying the things that you’re really good at and the things that you love, and then use a mixture of research and experimentation to figure out how those things can earn you an income in a way that is meaningful. This also doesn’t preclude the possibility that there might be something you love and feel a strong urge to do, but that you DON’T want or need to get paid for. In these cases, you might want to pursue a career that will support you to feed this craving. For those of us who thrive on variety (particularly those of us who have creative urges), it’s important to keep these two points in mind as we pursue the search for our Ikigai. Looking at the first caveat, for some it may be more desirable to create a portfolio career rather than a single source of income. Those who have portfolio careers piece together a variety of different activities which – all taken together – make you happy, and pay the bills. This is particularly common among professionals in the arts, for whom one single source of income may not be sufficient to pay the bills in and of itself, but which might be complemented by related pursuits. As an example, I’ll give my friend Miriam Castillo, who I interviewed recently for the Everyday Creative People podcast. Miriam started off in graphic design but soon realized that illustration was what she really wanted to do. Along the way she got really into yoga and decided to also become a yoga teacher. In the past year she has brought these two interests together to design a line of yoga clothing printed with her illustrations, as well as creating a meditation workshop based around coloring. Each of these activities satisfies a different need for Miriam. What’s more, she has discovered an overarching “reason for being” that brings all of these activities together under one umbrella: to inspire others through creativity. This overarching focus satisfies the “what the world needs” portion of the Ikigai equation, and each specific activity is a different way in which people are willing to pay for the thing that they need. As for the second caveat – that you may have something you love which you don’t need or want to make a living off of – I’ll use myself as an example. I spent much of my twenties trying to figure out what role I wanted (or rather, needed) the arts to play in my life. Straight out of college, having already decided to not pursue a performing career, I ended up working for a series of social justice-focused nonprofits. On a surface level, this work fulfilled all four points on the Ikigai: there were many things I loved about the work and was good at, and it certainly fulfilled my desire to make a positive impact on the world and paid the bills (sort of). But after a few years of this work I realized there was something missing in my life. I felt this giant hole where the arts used to be for me – and I wasn’t sure where to begin bringing them back into my life. That began a long process that ultimately landed me where I am today. I’ve come to realize that there are things I can do for a profession which meet every point of the Ikigai, yet don’t meet my need for creative fulfillment. As for my creative pursuits, I don’t care if I ever make any income off of them – I just know that I need to make time for them. This means that my career needs to support my creative interests: I can’t be so exhausted at the end of the day that I don’t have the energy to do my creative work, and I need to have an income that enables me to take classes and invest in supplies. I think one of the biggest mistakes that people tend to make is assuming that there’s only one thing that can fulfill their Ikigai, and if they don’t find that one thing they’re doomed. But as you can see from the examples above, there are a variety of ways to find your Ikigai. You can learn more about Dena and her work at denaadriance.com, or check out her podcast, Everyday Creative People. While working from home definitely has its perks, it also comes with a unique set of challenges. Without regular face time, you may struggle to feel like you’re truly a part of the team or you might have trouble deciphering your boss’ tone in emails. Whether you’re new to remote work or you’ve been at it a while, adopt these six habits to build a deeper connection with your manager and team. 1. When you’re in the office, maximize your time with team members. Be intentional about making both one-on-one appointments and group meetings. Never eat alone. Maximize the windows of time that you are with your coworkers in person to build relationships. 2. Remember birthdays and special dates. Put important dates on your calendar and make sure to send a gift or a note in celebration. This is a great way to build rapport with your team and show them that you care. 3. At least once a week, check in on life outside of work. Send your colleague a two-line email asking about her daughter’s school play. Start a meeting asking what everyone did over the weekend. Visit your colleagues’ social media profiles and comment on a photo. A great way to build rapport is to inquire about life outside of work. 4. Use video conferencing whenever possible. Google Hangouts, FaceTime, Skype, and Zoom are all great options for turning conference calls into video calls. Utilizing video increases feelings of familiarity and gives people the opportunity to remember that you’re not just a voice on the other end of the call. 5. Initiate optional opportunities for team members to connect. Most likely, leadership at your company is open to groups forming, they just don’t have the bandwidth to initiate them. So go ahead and take that initiative and start affinity groups like a book club, movie club, or fantasy football league. 6. Overcommunicate. Remember that folks in the office might assume you already know office news. So check in regularly. Ask if there is any news around the office that you should know. Building connection and camaraderie with your team as a telecommuter undoubtedly takes a little bit of extra effort. But the payoff is worth it. Implement these six habits and you will begin to build rapport with your team. A version of this article was first published on the McKinley Marketing Partners Blog. Answer These 3 Questions Before Putting Anything On Your To Do List. I get asked with some frequency about how I manage my time. And the truth is, while I've always had a knack for packing a lot in, I haven't always made decisions about time based on what's truly most important to me. It's easy to get swept up into what "feels" most urgent or what is happening right in front of you or what is being demanded of you by someone else. But the truth is, none of these are good indicators of how you should really spend your time. This week I want to share three questions to ask yourself before you ever dive into how to do more with less time. You have to start by getting clarity on what is most important before you ever figure out what needs to fit into your schedule. Time management is directly tied to having clarity about your priorities. So before you put something on your to do list, make sure you know the answer to these three questions. Getting clarity around these three questions will illuminate your highest priorities. These become your “big rocks” that go in your schedule before less important tasks. If you know what you ultimately want to accomplish and what is most important, you can make choices today that will help you make those dreams a reality. Living by your values is a critical component of effective time management. Get my best time management hacks in my eBook, More in Less: 21 Productivity Hacks for Creatives. I have never gone into an office full-time during my career. I recently started consulting with a company in their offices two days a week. One thing I've learned since I started working in an office setting on a part-time basis, is how much most people do not remotely desire to work from home. Wow, am I different from those who prefer to commute into an office. This got me thinking: why do I love working from home so much? In my experience, it's a mix of reasons: I love doing my own thing. I love working in spurts and then taking short breaks and totally switching gears. I love having the flexibility to totally rearrange my schedule if something special comes up (flipflopping night and day, starting my work 2 hours later, etc). I love the two+ hours it gives me back in my day that would have been eaten up by getting ready to go to work and driving in. Maybe you feel drawn to the work at home lifestyle too. I'm thrilled to share that I'm one of 45+ speakers who have joined together for the Work-At-Home Summit. This free event starts Monday January 29 and for six straight days super smart, successful people will be demystifying their work at home journeys. This free summit covers it all: goal setting, business plans, tons of work at home careers, advertising on Facebook--the whole nine yards. Check out the complete schedule and pencil in the sessions that you don't want to miss. Seriously, I've never seen such a high quality virtual conference offered for free. My session on content marketing and personal brand will be on January 31 at 11 am. There will also be a recording available later. Maybe you're interested in working from home but you're not totally sure if it's a good fit for you. I put together a top 10 list of characteristics for work at home types. Do any of these resonate with you? 1. You value autonomy. You are energized by making your own schedule. The idea of being your own boss feels right to you. When people say "I want to work in-house because I want to be a part of a team" it's kind of difficult for you to understand. 2. You like non-traditional hours. You don't hold a grudge if you need to work early in the morning or late at night. You actually prefer not to track hours but rather to just work until the work gets done. 3. You're highly organized. You are highly skilled at keeping track of deadlines and workflow. Project management may not be your favorite thing, but you can do it. You're great at keeping up with details whether or not you feel like that's your highest and best use. 4. You're cool with alone time. If you're a head down "work hard/play hard" kind of person, working at home may make sense for you. 5. You don't need outer accountability. You can stay on task and check off your to do list even without a boss checking in on you. You are intrinsically motivated. 6. Freelancing appeals to you. You like the idea of multiple projects for multiple clients. You're not intimidated by invoicing or negotiating contracts. You actually feel like freelancing is beating the system a little bit. 7. You're fine with sacrificing earning potential or benefits. It's worth it to you to sacrifice promotions or typical benefits like a company matching 401K in order to have the benefits of working at home. 8. You're very good at connecting with people. If you're a part of a remote team, you know how to connect with people and build rapport. You have to have this special skill because it is more difficult to do without the connection of regular face time. 9. You have an entrepreneurial spirit. If you've been told you have this--or you just know you do--a work at home gig might make it more possible for you to lean into your entrepreneurial side. 10. You pursue diverging goals. Working at home may be a good option for you if you want to pursue multiple career paths at once. Want to be a blogger and a caterer? A jewelry designer and a graphic designer? Working at home gives you the opportunity to split up your day however you like. Working at home is not for everybody. But for those of us who are drawn to it, man, it really increases our quality of life when we can find an opportunity that is in our sweet spot and also gives us the ability to work from anywhere. 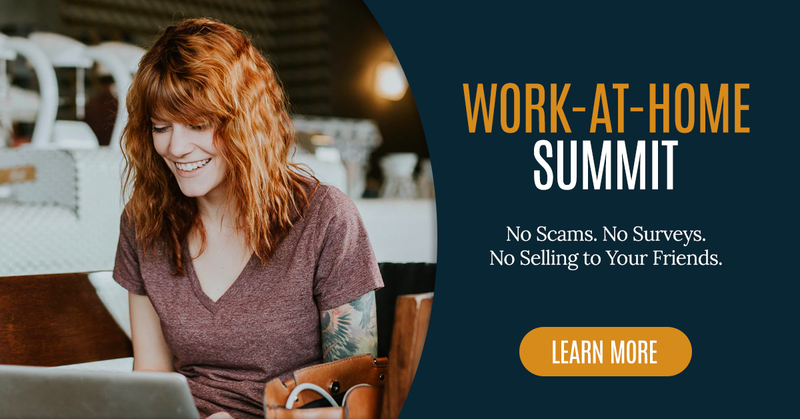 Whether you already work at home or are interested in learning about how you can get your work at home gig off the ground, don't miss the free virtual Work-At-Home Summit January 29-February 3. Grab your free ticket here. Happy January!! It’s the most wonderful time of the year! A natural blank slate. A fresh start. An opportunity to put life on “pause,” reflect, and adjust our sails. Some people begrudge January and “resolutions” because it seems to be an arbitrary time to change. But I think when the calendar gives us a good opportunity to designate a starting point, it’s great to take stock in our lives and our choices and adjust so we can have more alignment between our values and our reality. What do I want my life to look like in 10 years? What do I want to have accomplished when I look back on this decade? Where do I want my career to be? Family to be? Finances to be? Health to be? Where do I want to have spent my time? As a result I made a bulleted list of what I want to have achieved in 10 years. Then I decided to work backward. What do I need to accomplish THIS year to get me to where I want to be in 10 years? Then I worked backward again. Then I worked backward again. What do I need to do in January that leads me to three-month goals > one-year goals > 10-year goals? And thus I have a list of items to plug into my calendar this month that align with my values and will help move the needle toward where I want to be 10 years from now. And let me make a seemingly obvious point: what I want to accomplish over the next 10 years WILL change. And some of it will change as a direct result of the growth I’m experiencing in pursuing my “10-year goals.” So it’s never all for naught. Pursuing something, even if it will change, is the way to find your new goals and to grow. So as I was thinking through this 10>1>Q1>Jan process, a word hit me that truly encompasses what I want to do: steward. I want to make choices that reflect being a good steward of what God has given me: my time, my talents, my health, my money, my relationships. So that’s my word for the year and it helps inform every decision I make. If I am being a good steward of this aspect of the life God has given me, what choice am I making? The answer is almost always clear. I’d love to hear—what is YOUR word and why did you choose it? What does it mean to you? PS- Enrollment for my eCourse Get Your Dream Off the Ground is open now! And if you register by Friday January 5 you'll get all the 21-day eCourse materials plus a one-on-one coaching session with me! Click here to register. Feeling "cuddly as a cactus?" Here are 6 ways to avoid being the Grinch this Christmas. Harsh reality: the holiday season can be a pressure-filled time where there’s more to do than time to do it. 1. Release yourself from doing things you’re “supposed to do.” I have friends who have a blow up Christmas tree. It was meant to be a giant cartoonish Christmas tree on someone’s lawn but it’s in their living room and they love it. They never got excited about having a real tree, decorating it, taking it back down, etc. They decided that at their house, this is their preference. There are no hard and fast rules about the holiday season. Discover the traditions that you love. Implement those and don’t worry about the rest. Release yourself from what you’re “supposed” to love about the holidays and do it your way. "There are no hard and fast rules about the holiday season." 2. Set a budget. We can all get carried away with spending this time of year. Oh that plastic just doesn’t feel like it’s real money sometimes! Before getting in the heat of the moment at T.J. Maxx, decide what your maximum amount to spend is based on what your family can afford. Then work backwards. Who needs gifts? How much should be spent on your child’s teacher or your nephew? Stick to your budget so when you get that bill in January you won’t be doubly depressed that the holidays are over and reality has hit. 3. Jot down a “if I could do the holidays over” list ahead of time. Imagine yourself in January. What will you wish you had done differently over the holidays? More baking? Spent less money? Watched more classic movies? Gone caroling around the neighborhood? This ‘imagine being in the future and looking back technique’ can help you get perspective on how you really want to spend your time. 4. Join in with your loved ones' favorite holiday activities. Do your kids love driving around looking at the Christmas lights? Does your husband get misty watching It’s A Wonderful Life each year? Pay attention to those things that symbolize the holidays to your nearest and dearest. Make sure to include those to make really special memories. Be intentional with your time during this season. 5. Take some “you” time. When you’re the one doing the cooking, the shopping, the wrapping and the planning, you can run out of holiday cheer pretty fast. So delegate some of your to-do's to kids big enough to help or your spouse or other family members. Now make a list of ten activities you would enjoy but tell yourself you don't have time for. Then pick one of those self-nurturing activities and do it. 6. Remember that there’s no such thing as perfect even if Instagram tells you otherwise. Perfect is a myth. There’s no way to live up to the image that Pinterest, Food Network, Martha Stewart or that girl you went to high school with create. The most important aspect of the holidays is to remember why we are celebrating in the first place and to spend time with the ones we love. Bottom line: the joy of the holidays can quickly evaporate if we set expectations too high for the things that don't ultimately matter. Slow down and savor time with family and don't sacrifice your sanity just to make sure everyone gets 2 dozen toys on Christmas morning. Pay attention to your happiness meter. If you’re not getting your needs met it’s much harder for you to give to the ones in your life that you love. Still searching for the perfect gift for someone on your list? Registration for my 21-day goal setting course, Get Your Dream Off the Ground, opens January 1. Contact me to learn how you can gift the course. It's January. I know, potentially the most depressing month of the year as it is cold and dark and no longer filled with all things merry and bright but go with me-- it's the fresh-start-of-it-all. The blank slate. The new beginning. The infinite possibility. I love the beginning of the year and I love starting it after having done some reflection and planning. If you want to enter 2018 with intention, I invite you to download my brand new free resource: the Get Your Dream Off the Ground New Year's Goal Setting Workbook. In this workbook you'll walk through questions that will give you clarity on exactly what needs to happen in your life in order to achieve your goals in the new year. And if you're curious about my eCourse, Get Your Dream Off the Ground, this is the ideal appetizer to that main course. If you're ready for this to be the year that your aspirations become a part of your real life, start by downloading the workbook. Get the New Year's Goal Setting Workbook! And don't forget to enter Hilary's Holiday Giveaway! The contest closes Thursday December 14! There are six ways to earn entries and you can earn a new entry every day! Enter here. I think we all know at this point that what you see on the Internet is not the whole story. Here’s what you’ve seen from me this year: a big move, commitment to get out of my comfort zone, a lovely trip to Europe, and resources to help you maximize your time and reach your goals. But there’s a lot more to my life than what you see on social media or here on my blog. I want to pull back the curtain a little bit today. This has been one of the most challenging years of my life. My typically plucky, optimistic self was anxious, worried, maybe even depressed. This year I experienced some big life transitions, some disappointments, and a lot of uncertainty. For months at a time I didn’t go a whole week without crying at some point. (Not at all normal for me.) I felt fragile and worried. The fog has begun to lift, but I haven’t felt solidly like myself for longer than the past four weeks or so. So while I’m doing pretty good now, I can’t say for certain how long this “feeling normal” will last. It still feels new. Today I want to share what I think has been particularly instrumental in helping that fog to lift. Earlier this year I was introduced to something that has been nothing short of transformative for me: the Enneagram. And while I must admit that I’m a sucker for just about any personality explanation (Please let’s figure me out and everyone else!! ), this one in particular has been helpful to me more than any other. Not only because it has helped me identify my strengths, but because it has also helped me see my weaknesses and how both my strengths and weaknesses stem from the same thing in me: a focus on rich experiences and the future. Prior to reading about my type in the Enneagram books that I’ve read (this one and this one), I didn’t realize that the primary thing that I try to avoid at all costs is pain. Well, I actually did know that, but I didn’t realize that it was a unique quality to my type. Not everyone avoids it quite like Sevens. We don’t like confrontation. And we’re quick to look on the bright side of any situation. That sunny disposition is good until it’s time to deal with some real life stuff—in which case, well, we hate that and avoid it like the plague. Not only is every type not quite avoiding pain like Sevens, but not everyone is constantly striving toward excitement, fulfillment, and the best experiences in life quite like Sevens either. Through studying the Enneagram, I’ve learned that the Sevens’ biggest challenge as well as our biggest driver is that we are constantly looking toward creating a new and better future. This, in and of itself, is not a bad thing. It can be a wonderful thing. It can help change the world. But at the same time, if we are only looking toward the future and expecting fulfillment there, in short, we are missing our one precious life today. So how do you decide to change your ways? To not miss today? Well, lucky for me, the books I read gave me advice on the matter and it’s that advice that seems so obvious but is so transformative: gratitude. Implementing an intentional gratitude practice has transformed my life. And the research on gratitude is truly stunning. Studies have shown that people who implement a practice of gratitude in their lives are more optimistic, sleep better, and those that are sick have fewer symptoms. If you’re like me and you struggle with the fear of missing out, need to have something exciting to look forward to, and are constantly planning exciting adventures, I have to tell you—satisfaction is not in the future. A life focused solely on the future will leave you constantly wanting something new or something more. Get a journal that is meant solely for gratitude. Before bed each evening, jot down three things you’re thankful for. Start the day with a prayer of thanksgiving. Throughout the day, look for sights, smells, and sounds that you can include in your gratitude journal at the end of the day. Write a note to someone who has helped you in your life. Maybe it’s a quick Facebook message or maybe it’s a handwritten letter. Take the time to express your gratitude to him or her. Every other month, choose one close friend or family member in your life to express gratitude to. Try to do this on an unsuspecting month—not a birthday month. Devise something special that you can do for them to show appreciation. Satisfaction and fulfillment are in today. And the best way to renew your mind is to stop, look around, and express gratitude for what is in your life right now. It’s great to have something to look forward to, but it’s incredibly powerful to express thanks for what is already here. Don’t miss it. 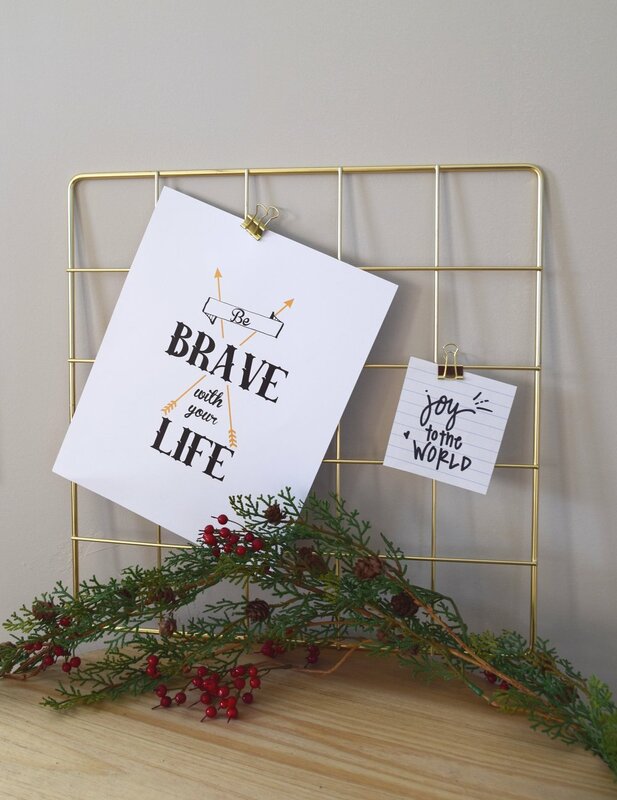 Giveaway: Win Everything In Hilary's Holiday Gift Guide! And it's not just because we're talking about perfect holiday gifts and stocking stuffers, but it's because I am ecstatic to finally be launching my first Holiday Giveaway! Nikki and I have been dreaming, scheming, and working on this giveaway for months and now the day is finally here! We are giving away a collection of some of my favorite gifts. I've done gift guides before (you can see the one for multi-hyphenates here and the one for entrepreneurs here) but this is my first time to actually give items away! I am WAY here for this. While each item here is adorable and/or amazing in and of itself, my favorite part about this list is that you can pick up each item at a local small business or small online startup. Let me do a run-through for you. 1. Art Print from the Honeysuckle Shop. Shelby Goodman is a designer, Mama to two, and a blogger. I love her inspiring, heartfelt designs. I have this one hanging in my home and I gave another to my sister. Our winner will get to choose between this one and this one! 3. Big Magic by Elizabeth Gilbert. I had to add this book to the giveaway because I absolutely loved it. Every creative needs to read this book! I'm so into it, I wrote a summary and discussion guide your book club can use when you read it. Enjoy. 4. Cozy Plaid Scarf from 3just3. The temperature has officially dropped over here on the east coast so that means I'm wearing scarves every. day. This one is a perfect statement. 3just3 is an adorable family-owned online shop. If you're stumped for a gift for a woman in your life--when in doubt, an accessory does the trick. And the prices at 3just3 are just right! 5. "Throw Kindness Around Like Confetti" pencils, desk pad, and notebook from the Conscious Mercantile. The products in this Lynchburg, VA shop ooze with personality. You'll see what I mean if you check out their Instagram. The cards are hilarious, the knickknacks adorable, and the paper products will make your desk the envy of all in the office. My favorite part is that the Conscious Mercantile gives a home to local makers. 6. "I <2 Typos" Tee from Radish Apparel. This is for my writer friends, english nerds, everyone who wants to throw a shoe at the Internet when someone incorrectly writes "there" instead of "their." As those closest to me know I have too many coffee mugs, Playbills, and graphic tees. But I LOVE them, so let me live! If you need a chuckle, head over to Radish Apparel's site and peruse their tees. They are hilarious (especially if there's anything inside you that is even a tiny bit nerdy). And bonus: 5% of every purchase is donated to a charity of your choice. Details: The giveaway runs until December 14. There are multiple ways to enter and you can improve your chances by entering all six ways (and you can even tweet a message every day between now and 12/14 for an extra entry each day! If you're really serious about winning those pencils, that's a good strategy.) May the odds be ever in your favor! Have you heard of a "Ta Da" List? Instead of a "To Do" List, you write what you've accomplished, after the fact. (I must be honest--I've been known to make both lists!) Well this week, I wanted to share with you a list that is somewhere between "To Do" and "Ta Da." It's a "What I'm Up To" List, but that doesn't quite have the same ring to it. I want to start by sharing this gorgeous illustration that Abby Hogle created to publish in our #notetoself✒️ collaboration series on Instagram. I've been partnering up with artists who've put their own unique interpretation on quotations from my writing. The illustration below originates from this blog post. I absolutely love what Abby and the other incredibly talented artists have created! Check out the whole series and connect with me on Instagram! I'm finishing up my first 90 days as content marketing consultant at McKinley Marketing Partners. I’ve gotten to do a ton of research and writing on all things careers and I'm having a blast. A few of my favorite pieces I've worked on are 6 Habits Every Telecommuter Should Implement to Build Rapport, 5 Best Kept Secrets to Get a Recruiter's Attention on LinkedIn, and 5 Mistakes to Avoid When Marketing to Generation Z.
I'm in the homestretch of my fourth year teaching social media and communication classes at SNHU and it's been the best year yet. SNHU was recently named most innovative university in the north for the third time! I’ve got a brand new book proposal that is undergoing the finishing touches and will soon be going out to publishers. Nikki and I have been prepping for the first epic Favorite Things-esque Giveaway on my blog. We’ve aggregated items from several different shops that I'm very excited about. I wish I could enter the contest! The list of the goodies and the giveaway will go live in mid-November! Keep an eye out for it. I'm preparing for my talk on actor side hustles at the Virginia Theatre Conference next week. 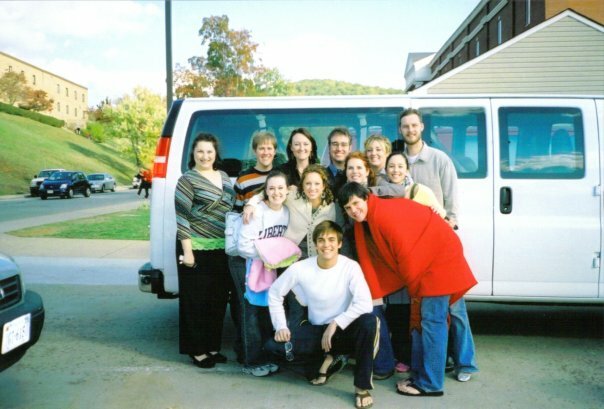 I took a trip down memory lane as I was working on the talk and found this photo from when I went to VTA back in college. I think this was taken on a disposable camera! And I've been doing a lot of research as I'm preparing to share work/life balance tips with the Young Professionals of Central Virginia on November 6. Did you know young professionals are the most likely age group to not use all their vacation days? And they are much more likely to feel ashamed for taking or planning a vacation than older workers. Check out the whole Project: Time Off study here. On a personal note my husband and I are celebrating our 5th wedding anniversary this weekend and I cannot believe how time truly flies. It's been the best, best, best five years. In this week's Tuesday Tip, I'm sharing two strategies that I use every single week to maximize my time. Whether you have one full-time job and are balancing work and home life, or are a multi-hat wearing multi-gig-er, or an entrepreneur who is selling, managing, and innovating--these two strategies will help you get more done in less time. Have you downloaded the free Social Media Audit Checklist yet? If you want to make sure your social media strategy is effective and efficient, download it today. I’m thrilled to share a brand new resource free to download: the Social Media Audit Checklist. If you know you should be on social media and you’re consistently posting but you’re not really sure how you’re progressing or which platform holds the most potential, this printable is for you. While I’ll be the first to raise my hand as a loyal member of the “Data and Analytics Make My Eyes Glaze Over” Club, I am a big fan of knowing how to best use my most finite resource: time. By walking through the social media audit checklist you’ll do some reflecting on why your business is on social media in the first place, how you’ve been doing thus far, and what you need to do differently to move in the direction of your goals. It's just one way to do More in Less. Grab the social media audit checklist free here. Today's #TuesdayTip combats all three!